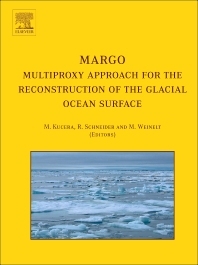 MARGO - Multiproxy Approach for the Reconstruction of the Glacial Ocean surface summarizes the results of the MARGO international working group, with the aim to develop an updated and harmonised reconstruction of sea surface temperatures and sea-ice extent of the Last Glacial Maximum oceans. The MARGO approach differs from previous efforts by developing and consistently applying measures of various aspects of reconstruction reliability, and by combining faunal and geochemical proxies. In 14 papers, the volume provides a comprehensive review of earlier work and a series of new, proxy-specific reconstructions based on census counts of planktonic foraminifera, diatoms, radiolaria and dinoflagellate cysts as well as on Mg/Ca measurements in planktonic foraminifera. The approach of harmonising the calibration and application of different proxies is described in detail, various paleothermometry techniques and their results are compared and the challenge of treating sparsely sampled data as the basis for ocean circulation models is addressed. The use of stable oxygen isotope composition of foraminiferal shells as a proxy for past sea water composition is comprehensively reassessed, and a new approach to the transfer function paleothermometer is presented. This volume represents a landmark contribution to the understanding of ice-age oceanography as well as the proxies used to reconstruct past ocean states. The results will form the basis for forcing and validation of ocean circulation models. Multiproxy approach for the reconstruction of the glacial ocean surface (MARGO) (M. Kucera et al.). Planktonic foraminiferal Mg/Ca as a proxy for past oceanic temperatures: a methodological overview and data compilation for the Last Glacial Maximum (S. Barker et al.). Constraints on SST estimates for the northern North Atlantic/Nordic Seas during the LGM (M.Y. Meland, E. Jansen, H. Elderfield). A global compilation of late Holocene planktonic foraminiferal &dgr;18O: relationship between surface water temperature and &dgr;18O (C. Waelbroecket et al.). Sea-surface temperature and sea ice distribution of the Southern Ocean at the EPILOG Last Glacial Maximuma - a circum-Antarctic view based on siliceous microfossil records (R. Gersonde et al.). Reconstruction of sea-surface conditions at middle to high latitudes of the Northern Hemisphere during the Last Glacial Maximum (LGM) based on dinoflagellate cyst assemblages (A. de Vernal et al.). Planktonic foraminiferal assemblages preserved in surface sediments correspond to multiple environment variables (A.E. Morey, A.C. Mix, N.G. Pisias). Reconstruction of sea-surface temperatures from assemblages of planktonic foraminifera: multi-technique approach based on geographically constrained calibration data sets and its application to glacial Atlantic and Pacific Oceans (M. Kucera et al.). Glacial Mediterranean sea surface temperatures based on planktonic foraminiferal assemblages (A. Hayes et al.). Sea-surface temperatures around the Australian margin and Indian Ocean during the Last Glacial Maximum (T.T. Barrows, S. Juggins). Estimating glacial western Pacific sea-surface temperature: methodological overview and data compilation of surface sediment planktic foraminifer faunas (M.-T. Chen et al.). Patterns of deglacial warming in the Pacific Ocean: a review with emphasis on the time interval of Heinrich event (T. Kiefer, M. Kienast). Perspectives on mapping the MARGO reconstructions by variogram analysis/kriging and objective analysis (C. Schäfer-Neth, A. Paul, S. Mulitza). How to combine sparse proxy data and coupled climate models (A. Paul, C. Schäfer-Neth).